Edited by Jayne Mulholland, RN, CEN, CCRN, this is a collection of Frequently Asked Questions articles, written for new ICU nurses: numbered questions, followed by our own answers, written by two seriously over-experienced bedside practitioners. This has been our labor of love for the past few years. Topic material comes almost entirely “from the shop floor”, reflecting what we actually do at work. Subjects we’ve covered include: “Starting Out in the ICU”, an arrhythmia review, vents and ABGs, balloon pumping, PA lines, arterial lines, central lines… 25 areas altogether, with a strong emphasis on humor. The response has been great! We hope you’ll find them useful. You know how you try to learn something very complex from a textbook and you don't "get it", but then a seasoned colleague tells you the same thing in simple, understandable words and then adds some humor to the whole serious subject and suddenly a light goes on and you say "OH so THAT"S what it means!!" Well, this entire book is like that. It's not only for newcomers to ICU either. There's plenty of "stuff" that we old -timers need to review, refresh or..dare I say it....still learn! If you're new though, this book is like having a mentor on your shoulder or in your pocket. You'll understand so much better the things you'll need to know to feel confident working in the ICU. I love this book for what's in it and especially for how the author uses an abundance of dry, intelligent wit to get some tough points across. Get this one, you won't be sorry! I stumbled on Mark's website while searching for info on interpreting ECGs for my CCU class in nursing school. I couldn't open all of the topics, but the ones I did were wonderfully clear and concise--considerably more "comprehensible" than the countless texts I have at home. I wrote to Mark and asked him why I couldn't open some files, and incredibly, he wrote back the next day! Anyway, I was about to send him another note and mention that he should write a book, then I looked at his webpage and saw that he had! I just placed my order! This is a lifesaver for me! Absolutely the BEST resource for new nurses in the ICU setting and even for those older nurses. Information is given in small tidbits and with humor to boot! It is always my first resource to suggest when a nurse comes to me looking for down to earth info ont he nitty gritty basics of ICU nursing. I am thrilled that there will be an expanded version and I will be one of the first in line to buy that book as well. Thank you thank you thank you for all that you do for so many. We appreciate it! I first stumbled on this website for a review after being out of ICU for a while. It is so easy to read and understand and the pictures are great. I have recommended this website to all my friends. I am waiting ***impatiently*** (lol) for the next edition of this wonderful book. I can't say enough about how much these articles have helped me. Thank you so much for all you do. I work in the aeromedical field and found this book to be the most comprehensable and easy to read book I've ever read. More impressive than that is that I actually read it.......and liked it!? Its also a essential guide if your planning on taking the CCEMTP program. 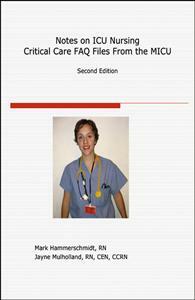 A MUST HAVE for any Critical Care Practitioner! I must confessed that I was scared to death the day I showed up at the MICU for the first time for my senior practicum that I came back raking the internet for help. And I think Mark's stuff on line was a divine intervention for me. I will buy every edition he comes out with. If all scientific information were presented as he does the world would have been a different place. Dummies would be geniuses. Mark deserves the Nobel Prize for creating the intersection of science and humor. I have used the information presented in your book and on your website to educate our Paramedics on the equipment and issues we run into while performing Advanced Life Support Interfacility Transfers from "your" ICUs. While I am sure you intended this to be a resource for RNs this information is extremely valuable to your peers ...Paramedics. Thank you for such a comprehensive guide. We have not only included this information in our educational programs but also in the Clinical Resource Manuals placed in each of our Advanced Life Support Ambulances. This information is applicable to our role in Emergency Medical Services - 911 Response as well as Interfacilty Transports. Thank you very much!!!!! I assure we have awarded full credit to you for your hard work. From your partners in quality patient care...the Paramedic!!! I was a fan from the beginning when I stumbled on the website years ago, and was one of the fortunate early recipients of a free CD...I STILL use the CD AND site, refer my friends to it, and recommended it to my students and graduates that I precepted. You won't find a more thorough, fun way to learn the necessities of an ICU... I'm still a big fan Mark!! honestly i'm not yet read this book but all the responder can showed us how great u are.i'm icu nursing,Malaysia, always support our nurses and my experience in icu nursing really wonderful and adventure.i hope i can find this book in Malaysia.CONGRATULATION TO U! Hello there, I would love to buy this book as the reviews are fantastic; however it is starting to look a bit dated as the last edition was done in 2003. Can we expect a new edition soon? -waiting to buy! I have to say, reading this book put me at ease but also made me scared at the same time :) I will also say that I felt a sense of comfort knowing I have this book by my side when things come up at work. THANK YOU for writing such a wonderful book.